Remember making those paper mache doohickeys at the craft table back in kindergarten? Well, multiply that by a very, very large number and you get the work of Peter Gentenaar, a paper artist based in the Netherlands. Comparing a sheet of paper to a leaf on a tree, his amorphic, floating sculptures defy conventional thinking on the material's colloquial, everyday use. Peter Gentenaar‘s art was born out of the limitations of what he could (or couldn’t) create with store-bought paper. So with the help of the Royal Dutch Paper Factory, he built his own paper factory and devised a custom beater that processes and mills long-fiber paper pulp into the material you see in his artwork. He saw the potential that wet paper had when reinforced with very fine bamboo ribs, and he learned to form the material into anything his imagination would allow. In honor of the 25th edition of the festival of classical music of St. Riquier, more than 100 of Gentenaar’s empyrean paper sculptures were on display inside the French abbey church and adjoining monastery last summer. Suspended from the Gothic arches of the centuries-old structure (built in 638), his paper sculptures resemble multi-colored jellyfish swimming in a sea of white limestone. Gentenaar’s current exhibit in Doesburg runs until March 12th. 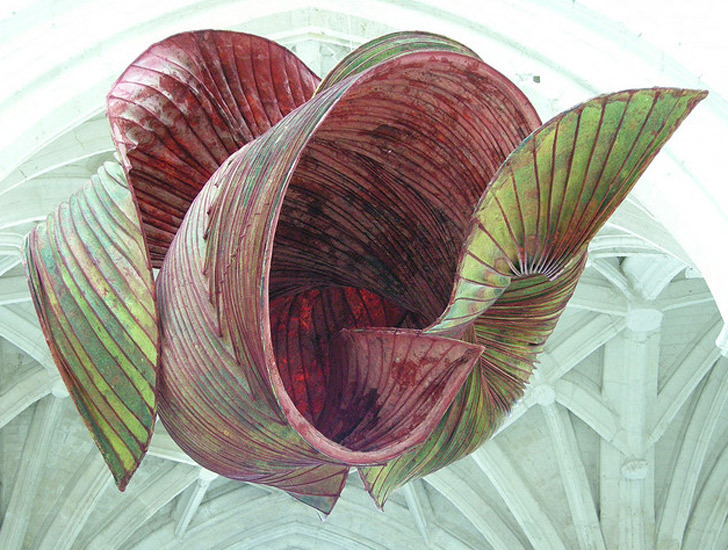 Peter Gentenaar's art was born out of the limitations of what he could (or couldn't) create with store-bought paper. So with the help of the Royal Dutch Paper Factory, he built his own paper factory and devised a custom beater that processes and mills long-fiber paper pulp into the material you see in his artwork. He saw the potential that wet paper had when reinforced with very fine bamboo ribs. He learned to form the material into anything his imagination would allow. Gentenaar describes the process: "By beating my pulp very long, an extraordinary play of forces occurs during the drying processes of my paper sculpture." "The paper will shrink considerably, up to 40%, and the forces associated with this put the non-shrinking bamboo framework under stress." "The tension between the two materials transforms itself into a form reminiscent of a slowly curling autumn leaf." 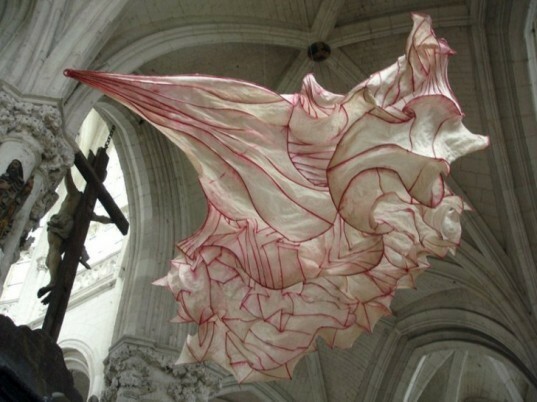 In honor of the 25th edition of the festival of classical music of St. Riquier, more than 100 of Gentenaar's empyrean paper sculptures were on display inside the French abbey church and adjoining monastery last summer. Suspended from the Gothic arches of the centuries-old structure (built in 638), his paper sculptures resemble multi-colored jellyfish swimming in a sea of white limestone. Gentenaar's current exhibit in Doesburg runs until March 12th.